"When I have mine powa chair, I walk ovah der by mine self"
Abigail is just about as sweet as they come. From the moment you meet her you are destined to love her because her face just oozes friendliness and the kind of wonder that comes with the territory with most three year-olds. 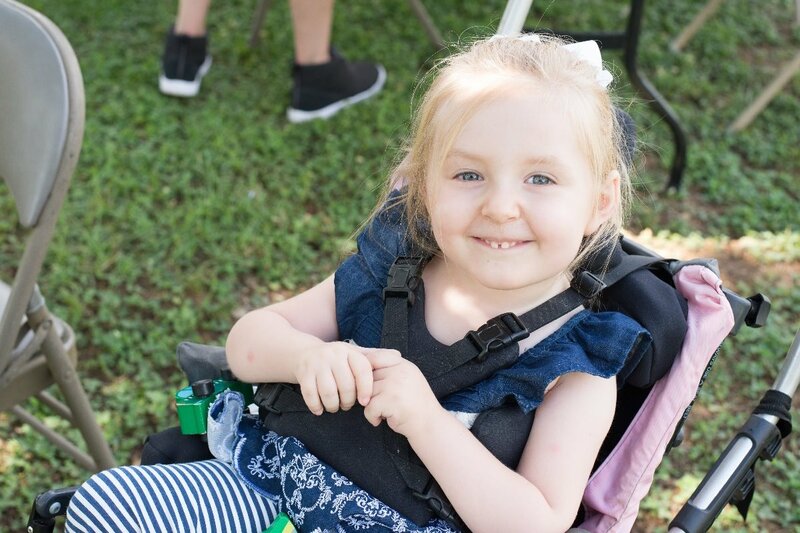 Abigail's journey in life has been tougher than most though because of her rare genetic disease called SMA (Spinal Muscular Atrophy) which affects the nerve cells in the spinal cord responsible for muscle contraction. Not only does this severely affect her mobility but also her breathing, swallowing and several other muscular functions. Her thoughts, dreams, hopes, cares and worries are all what you will find in any thriving young child, but her body is keeping her tied down. Her sweet and loving heart comes from her wonderful parents and family who have helped her to choose to be a thermostat and not a thermometer - she decides how she is going to affect the things around her instead of just reflecting her circumstances. "I walk ovah der by mine self"
To this sweet soul, having a power chair equals walking and having the freedom to move without being carried or pushed. 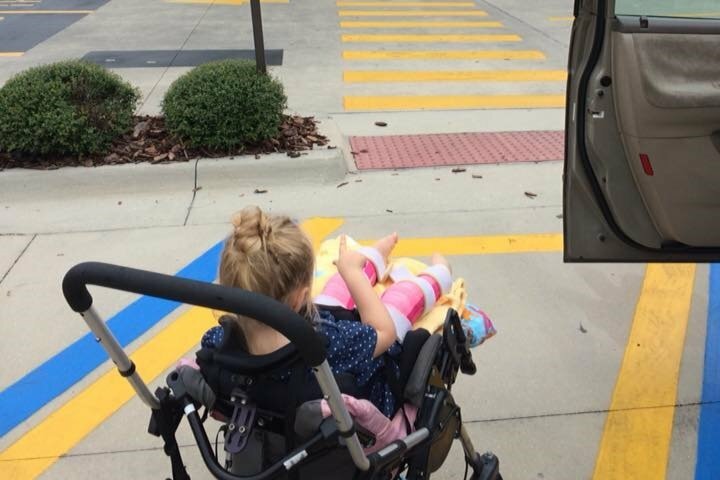 Fortunately, insurance has just approved the cost of the power chair that she needs. However, with this power chair comes a significant shift in her ability to travel with her loving family - Jared, Kathryn and her doting older sister Hadassah (6). The chair weighs nearly 300 pounds and cannot be carried or broken down so a customized vehicle is needed in order to safely and securely transport the chair. A used Toyota Sienna that has been converted costs about $50k-$60k. In addition to the purchase cost, there are several additions that will need to be made to accommodate her specific needs including battery backups for breathing machine support should they ever lose power (hurricane season! ), special docking for her chair and other miscellaneous things that come with making these accommodations. Based on research they should be able to find something local to the Tampa area but they are a young, single-income family and in reality, this is a just a small part of the expenses that are required to care for Abigail. Jared and Kathryn did not ask for this site to be set up. They are God fearing Christians who trust in Him and sometimes what that means is prayer and giving others a chance to serve through efforts like this. 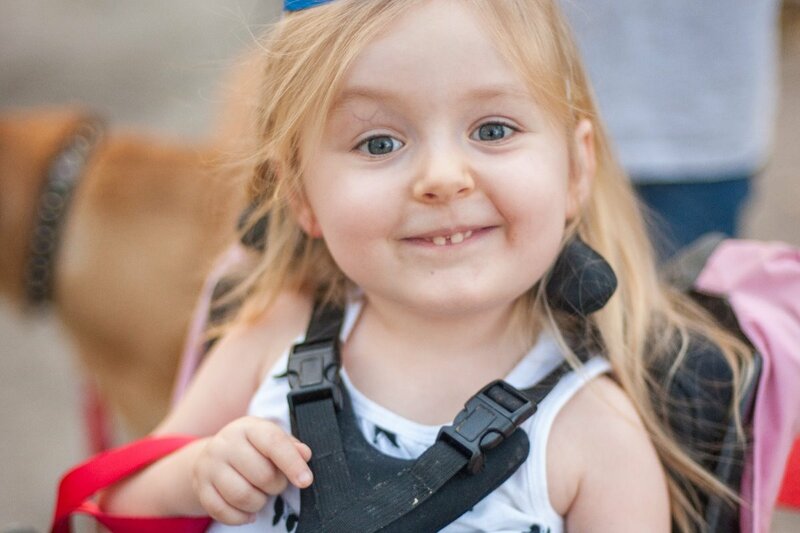 Your support means: Abigail can travel with her family and "walk" where she needs to. Kathryn and Jared will no longer have to transport Abigail in a car seat that cannot be installed properly for impact safety because her body is incapable of sitting upright in a typical car seat. It means helping a child that wants to be a thermostat even though being a thermometer would be so much easier. SMA (spinal muscular atrophy) is a disease that robs people of physical strength by affecting the motor nerve cells in the spinal cord, taking away the ability to walk, eat, or breathe. It is the number one genetic cause of death for infants. SMA affects approximately 1 in 11,000 babies, and about 1 in every 50 Americans is a genetic carrier. SMA can affect any race or gender. 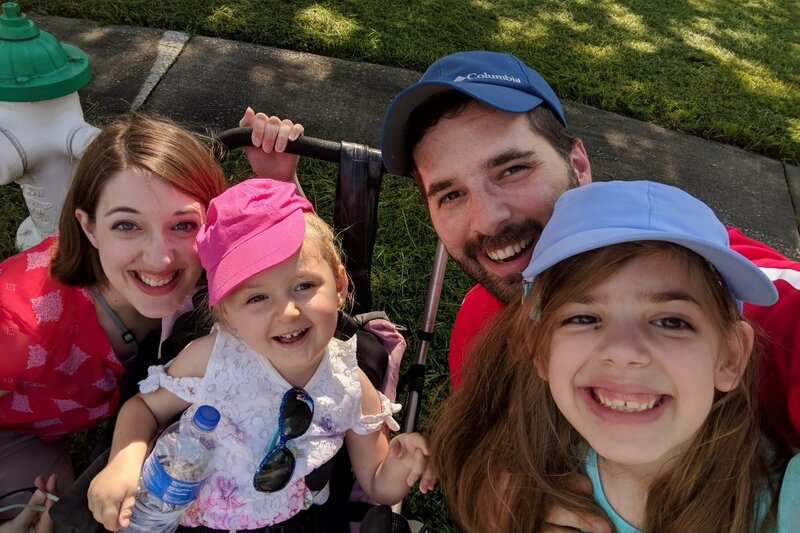 Jared and Kathryn Saltz have determined that any money raised over their specific need will go towards a foundation created by a fellow SMAer to help those who need medical equipment such as chairs, lifts, and adaptive technology. To learn more about SMA please visit www.smafoundation.org or www.curesma.org. Kathryn, Abigail and I will be on a short segment on our friend's radio show out of Alabama this morning - The Mark White Show. If you want to listen live, search for @TheMarkWhiteShow on Facebook starting at 11:45 EST (10:45 CST). 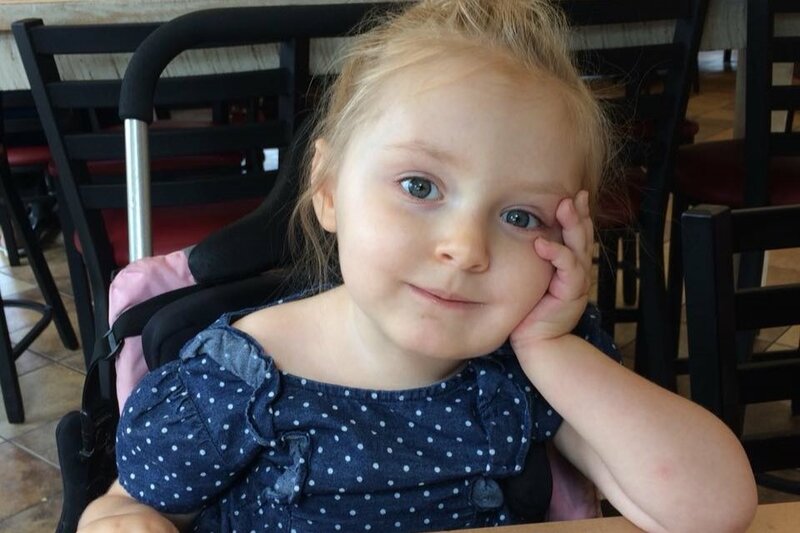 There is also a link on the Wheels For Abigail face book page ( http://fb.me/wheelsforabigail) on the post from this morning. To our supporters first - there is a really exciting announcement that we want you to know about first so please listen in if you have a few minutes!! Hi everyone - We will be doing a live interview with Abigail, Jared, Katherine, and Hadassah tonight at 8:00 PM. We'll talk more about the progress you have made so far, Cure SMA , SMA awareness, and of course more good jokes! Oh, and Abigail will get to pick the mask that David has to wear and sing "You Are My Sunshine". Please post any questions you would like answered or have some ready to ask, join us at 8 EST tonight, and share this post so we can reach as many as possible. Any other families who are SMAwesome! are welcome to join as well. Wow, everyone! Thank you so much for your donations so far. In less than 24 hours you have helped to raise nearly $7000! We had a radio show in Alabama share the effort this morning (thanks Mark White!) and people are continuing to share and donate. If you haven't already please take a moment to go to the Facebook page and invite your friends to like and share!